This section will detail how to work with the styles pages in the Web administration interface. For more information on styles and syntax, please see the main section on Styling. Styled Layer Descriptor (SLD): An OGC standard for geospatial styling. Available by default. Cascading Style Sheets (CSS): A CSS-like syntax. Available via an extension. YSLD: An SLD-equivalent based on YAML for improved authoring. Available via the ysld extension . 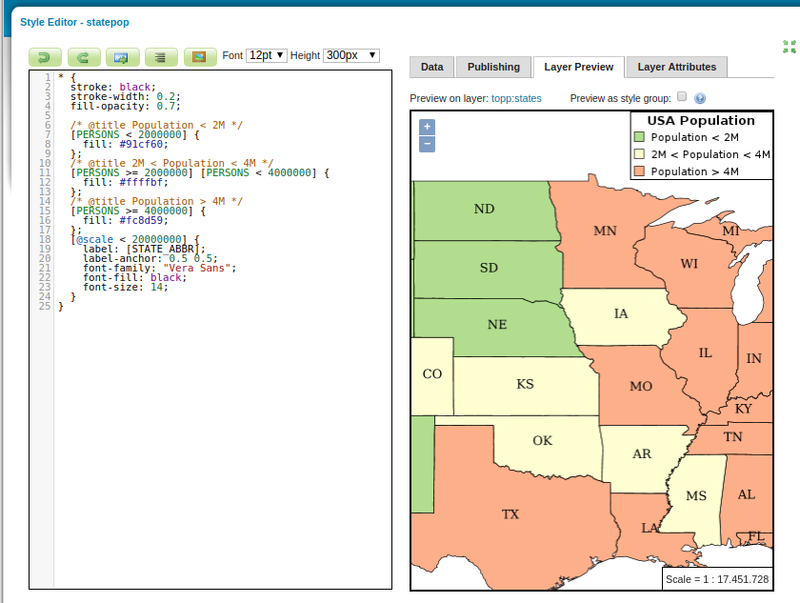 MBStyle: A syntax based on JSON for improved interoperability. Available via the mbstyle extension . 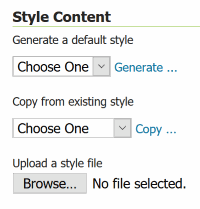 On the Styles page, you can add a new style, remove a style, or view or edit an existing style. The buttons for adding and removing a style can be found at the top of the Styles page. To add a new style, click Add a new style button. You will be redirected to the new style page, which is the same as the Style Editor Data tab. Type the style definition directly into the editor. Generating a new default style. When creating a style, only the Data tab will be available. Click Apply on the new style to stay on the Style Editor page and gain access to all tabs. Click OK to remove the selected style(s). On the Styles page, click a style name to open the Style Editor. Apply Makes the changes to the style and remain on the Style Editor page. This is useful to update the Layer Preview tab. 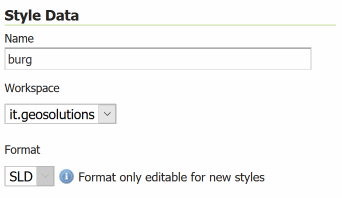 On all tabs, the Style Editor will display the style definition at the bottom, allowing for direct editing of the style. Switch between the tabs in order to facilitate style creation and editing. The style editor supports line numbering, automatic indentation, and real-time syntax highlighting. You can also increase or decrease the font size of the editor. During editing and especially after editing is complete, you will want to check validation of the syntax. This can be done by clicking the Validate button at the bottom. The Data tab includes basic style information, the ability to generate a style, and legend details. Workspace Workspace in which the style is contained. Styles can be inside workspaces, but can also be “global” (no workspace). Format Format of the style. Options are SLD, CSS, and YSLD, MBStyle depending on availability. Generate a default style Selects a generic style based on geometry. 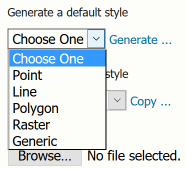 Options are Point, Line, Polygon, Raster, and Generic. Click Generate when selected. 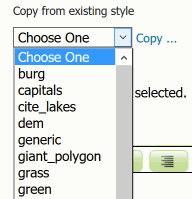 Copy from existing style Selects an existing style in GeoServer and copy its contents to this style. 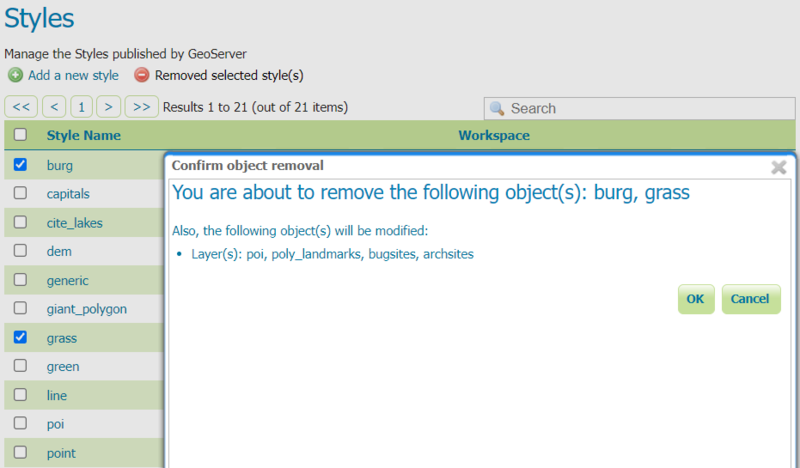 Any style in GeoServer is available as an option. Not all styles will work with all layers. Click Copy when selected. Upload a style file Selects a plain text file on your local system to add as the style. Click Upload when selected. Online Resource Path to the custom legend graphic to use. Can be a URL or a local path (relative to the style file path). See Structure of the data directory for a description of the styles directory. Discard legend Will remove the settings for the custom legend graphic and will instead use the default generated legend. The Publishing tab displays a list of all layers on the server, with the purpose of showing which layers are associated with the current style. Layers can set a single default style and have any number of additional styles. If this style is set to be either of these options for a layer, it will be shown with a check box in the table. It is very common to have to iterate your styles and test how the visualization changes over time. The Layer Preview tab allows you to make changes to the style and see them without having to navigate away from the page. The Layer Preview tab shows a single image. GeoServer tries to identify which layer should be shown (for example, a layer for which this style is the default), but if the layer being previewed is not the desired one, click the layer name above the preview box and select a layer. 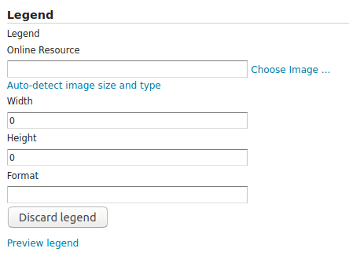 The Layer Attributes tab will display a list of attributes for the given associated layer. GeoServer tries to identify which layer should be shown (for example, a layer for which this style is the default), but if the layer being previewed is not the desired one, click the layer name above the table and select a layer. type Type of the attribute. Can be a numeric (such as “Long”), a string (“String”), or a geometry (such as “Point”). The button turns into a “inwards arrows” icon, pressing it resumes the original editing mode.